By CE Pro Editors · September 28, 2016 • Barco released several stunning new products at CEDIA, including its Loki 4K UHD projector, Direct LED Wall and the Thor 4K 6P laser projector. By Arlen Schweiger · September 23, 2016 • The single- and three-chip long-lasting laser projectors from DP deliver 8,000 and 12,000 lumens, respectively, and at $20K and $45K drop the company's entry into 4K way down. 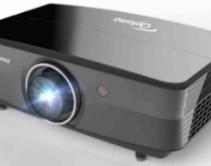 By Robert Archer · September 15, 2016 • In addition to its LS10500 4K projector, Epson has also announced its Home Cinema 3100, Home Cinema 3700 and Home Cinema 3900 products. See them all at CEDIA 2016. By CE Pro Editors · August 25, 2016 • After Barco's success at CEDIA 2015, the company looks to take it to the next level with its 4K 6P laser projector and a sneak peak of the new Alchemy server in its home cinema demo at CEDIA 2016. By Julie Jacobson · February 6, 2014 • Digital Projection demos HIGHLite Laser 12k, the first ever laser video projector with 12,000 lumens, 20,000 hours of solid-state illumination, surprising affordability.